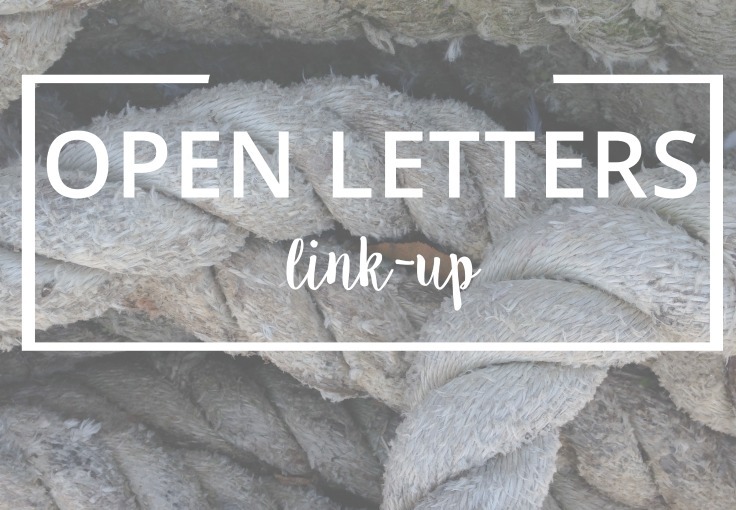 so glad you're here for the first ever open letters link-up! i had this idea last month when i shared my first open letters post, based on the fun "thank you notes" section in this book. my hope is that we'll get to support each other and have some fun with reading and sharing our letters. 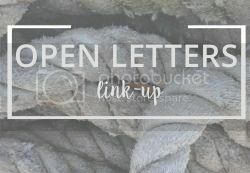 each open letter can be as serious or as fun as you'd like--whether you're writing to your high school self, to a friend, or to that faithful old pair of leggings. this month, my lovely cohost is victoria at through*for*by. she's an amazing cook, her work in her garden is wildly impressive, and if you're not sure what to read next check her book-related posts. also she taught me the difference between "chopped" and "minced." she's the real deal, friends. it is. we'd been hearing this scratchy sound in our crawl space and a small piece of siding was missing from the outside of our house. we thought it was birds. soooo, i banged on the crawl space wall while devin waited outside below the missing siding, BB gun ready. his flashlight attached to his BB gun failed at the exact moment a confused squirrel popped out of the crawl space. not a bird. it got away, but to you animal-loving, potentially judging folks: pests that come inside do not get to stay inside. (that wasn't too mean-spirited or threatening, right?) there's nothing more romantic and date-night appropriate than tag-teaming the attempted removal of a scratchy-noise-making animal from your crawl space. why has no one called you a breakfast food? i think (i.e., i can personally attest) that 4 of you in the morning is a great start to the day. the whole point of this link-up is to form community and meet some new bloggers, so don't drop your link and run. any unrelated posts will be removed at the hosts' discretion.